MONTREAL--(Marketwire - August 8, 2008) - Softimage Co., a part of Avid Technology, Inc. (NASDAQ: AVID), today announced it has begun shipping SOFTIMAGE®|XSI® 7, the latest version of its professional 3D animation software for games, film and television. Along with many substantial new features, SOFTIMAGE|XSI 7 is shipping with ICE, a transformative open platform designed to capture the infinitely creative vision of content producers. With a visual interface and an easy-to-use node-based programming model, users will be able to quickly create complex visual effects. ICE allows artists to explore, learn and modify the robust library of particle-based visual effects and deformation tools available in SOFTIMAGE|XSI 7 software, or simply build new ones from scratch. "The new features in XSI 7, along with the new ICE platform, represent a major leap for Softimage," said Aloys Baillet, Research and Development Lead, Animal Logic, Australia. "The new ICE platform allows our artists and TDs to maximize their creative endeavors on our latest projects with new ways to create complex deformations and character effects in this impressive node-based workflow -- and because it's multi-threaded, we're seeing significant performance gains on our multi-core workstations." SOFTIMAGE|XSI 7 software offers features developed for and inspired by its customers. Along with the new multi-threaded ICE platform, SOFTIMAGE|XSI 7 is shipping with pre-built, production-ready ICE 'compounds' for complex particle-based effects and deformations allowing artists and TDs to jump right into production. Additional features include: rendering support for mental ray v. 3.6; Delta II, an updated, lightweight referencing system; a new Real-Time Shading architecture; and a streamlined licensing process; User Interface & workflow improvements across several toolsets; and many other enhancements based on clients' requests. Digital Tutors also provides a FREE DVD with official Softimage training material, exclusively created for SOFTIMAGE|XSI 7. 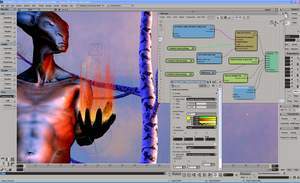 For a full list of features in SOFTIMAGE|XSI 7 software, and to see demonstration videos, visit: www.softimage.com. View the SOFTIMAGE|XSI 7 Web launch video at: http://features.cgsociety.org/story_custom.php?story_id=4595. "SOFTIMAGE|XSI 7 with the new ICE platform represents another significant milestone in our 22-year history," said Marc Stevens, general manager of Softimage and vice president of Avid Technology, Inc. "The incredibly positive reception from artists and TDs globally validates our objectives -- provide a platform to easily create, modify and deploy complex tools and effects more efficiently than ever before." SOFTIMAGE|XSI 7 is available now for purchase from a local Softimage reseller or sales representative, or on the Softimage Web store at: http://www.softimage.com/buy/. Pricing for SOFTIMAGE|XSI 7 Essentials will be USMSRP $2,995. Pricing for SOFTIMAGE|XSI 7 Advanced will be USMSRP $4,995. Softimage also offers a compelling maintenance program that provides extended customer support and upgrade advantages. All Softimage customers and 3D enthusiasts can join the SOFTIMAGE|NET community site, where a dedicated forum is in place to post and share member-created ICE compounds. Softimage is a part of Avid Technology, Inc., and develops leading-edge 3D technology used in customer-centric solutions that enable professionals in the games, film and television industry to realize their creative vision. Award-winning feature films, television productions and top-selling video games are made using Softimage software. Its flagship product, SOFTIMAGE|XSI, is an extensible 3D animation software solution built on the most modern architecture in the industry and is used by leading media and entertainment companies such as Digital Domain, Ubisoft, SEGA Corporation, CAPCOM, Animal Logic, and The Mill. Other solutions from Softimage include: SOFTIMAGE|FACE ROBOT®, lifelike facial animation software; SOFTIMAGE|CAT™, a complete character animation plug-in; and SOFTIMAGE Alienbrain®, a digital asset management solution for artists. 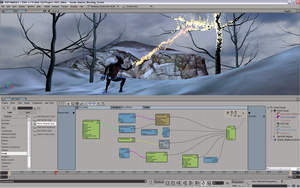 For more information about Softimage, visit www.softimage.com. Avid is a worldwide leader in tools for film, video, audio, 3D animation, gaming and broadcast professionals -- as well as for home audio and video enthusiasts. Avid professional and consumer brands include Avid®, Digidesign®, M-Audio®, Pinnacle Systems®, Sibelius®, Softimage and Sundance Digital®. The vast majority of primetime television shows, feature films, commercials and chart-topping music hits are made using one or more Avid products. Whether used by seasoned professionals or beginning students, Avid's products and services enable customers to work more efficiently, productively and creatively. Avid received an Oscar® statuette representing the 1998 Scientific and Technical Award for the concept, design, and engineering of the Avid® Film Composer® system for motion picture editing. For more information about the company's Oscar, Grammy® and Emmy® award-winning products and services, visit www.avid.com. © 2008 Avid Technology, Inc. All rights reserved. Product features, specifications, system requirements, and availability are subject to change without notice. Promotions and discounts are subject to availability and change without notice. All prices are USMSRP for the U.S. and Canada only and are subject to change without notice. Contact your local Avid office or reseller for prices outside the U.S. and Canada. Avid, Digidesign, Film Composer, M-Audio, Pinnacle Systems, Sibelius, Sundance Digital, Softimage, Face Robot, CAT, Alienbrain and XSI are trademarks or registered trademarks of Avid Technology, Inc. or its subsidiaries in the United States and/or other countries. Oscar is a trademark and service mark of the Academy of Motion Picture Arts and Sciences. Emmy is a registered trademark of ATAS/NATAS. Grammy is a trademark of the National Academy of Recording Arts and Sciences, Inc. mental ray is a registered trademark of mental images GmbH in the USA and other countries. All other trademarks contained herein are the property of their respective owners. Watch a Softimage customer-created video based on an actual commercial created with the new SOFTIMAGE|XSI 7 ICE platform (Interactive Creative Environment). Credit: VCC Perfect Pictures (Hamburg, Germany), Stefan Rueffer. SOFTIMAGE|XSI 7 is shipping with ICE, a visual interface and an easy-to-use node-based programming model, that allows users to quickly create complex visual effects. SOFTIMAGE|XSI 7 is professional 3D animation software for games, film and television. ICE allows artists to explore, learn and modify the robust library of particle-based visual effects and deformation tools available in SOFTIMAGE|XSI 7 software, or simply build new ones from scratch.